I don’t think necessity is the mother of invention — invention, in my opinion, arises directly from idleness, possibly also from laziness. To save oneself trouble. For this image I placed the gold mining plant at the top of the river, to position it’s dominance of the market, with a whimsically styled wildcat, a reference to rouge gold miners, panning for what gold is left downstream. The article seems to promote a coexistence between legitimate mining companies and wildcat miners, so I framed the image nicely with the Periodic Symbol “Au” at the bottom of it all. This illustration collects imagery of vegetation in reference to the article’s mention of the Garden of Eden in relation to Kurdistan. I wanted the overall composition to take on the yin and yang symbol of harmony, while the center is overtaken by an oil well. The article also gives hint to the potential for force being needed to protect the Kurdish “Garden of Eden”, so I included the translation for peshmerga, “those who face death”. While this article provides an onslaught of imagery, things like “heavyweight boxer” and “African giant”, I thought I’d introduce the imagery of the mythical Kraken. As the article describes the pros and cons of Nigeria becoming a major power, I got the sense of an ancient beast awoken and flailing around. The unpredictability coupled with their potential adds an ominous undercurrent to their being woken. …he was asked if there should be any rules for satire. “Yes,” he said, “to attack only the powerful, not the weak. What stood out to me from this article was a quote from Ahmed Sanoussi in the last paragraph. I chose a the imagery of a court jester in the classic “walk like an egyptian” pose, to signify the frailty of the comedian in the presence of modern day kings. The jester is surrounded by the call to attack the powerful, not the weak. In 2002 Thomas Rawski of the University of Pittsburgh complained about a ‘Tornado of Deception’. When looking into imagery to represent China’s prosperity, I came across the deity Cai Shen (and in particular, this image by artist Qin Jing Bin). 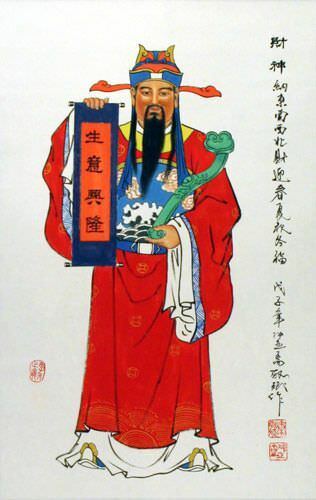 I chose an image of the God of Wealth with an eye patch to signify China’s view of their own statistics. The deity promoting a popular retail website, Alibaba, over a common farm animal highlights the growing awareness of the gap between rural folk and urbanites. Egypt’s police: What happened to reform? This image includes the Interior Minister, Muhammad Ibrahim, with his head in the clouds since his view of police brutality is considered “an attempt to create an alternative reality”. Beneath the clouds there’s a storm and the Nebty-Tepites, or “Two Ladies” – known as the ancient Egyptian protectors of lower and upper Egypt – are bound. The most intriguing part of this article to me was the interactions of Kyrgyzstan with a Canadian gold mining company, Centerra Gold. I thought an image of an aging Argali skull, a very large Kyrgyzstan sheep, and a Canadian goose flying away with gold in its mouth would capture that relationship. The imagery of two roosters coming together as one, seemed to be an appropriate representation of the two notorious gang leaders coming to a mutual cease-fire. The images at the feet of the roosters are meant to reference competing elements facing El Salvador. The history of gang violence, represented by the “18” baseball cap worn by Carlos Mojica Lechuga, competing with the extortion still rampant and the government attempts to provide alternative forms of income, shown by the hand-gun and loaf of bread. The banner that runs across the bottom displays in quotes, “Sanctuary”, which is the quickly rejected name for Peace Zones dedicated to changing the violent environment. Business conferences are filled with frothy talk of African lions overtaking Asian tigers. Besides the mounted Asian tiger, I injected some pretty obvious symbolism, as the African lion totes a gun and an IOU. Most of the Special Report shows the conflict of a rising African economic power, struggling with varied types of warfare. The dichotomy of internal war and economic growth, seems to draw attention mainly to the banks hopes of being repaid on their investments, hence the IOU.